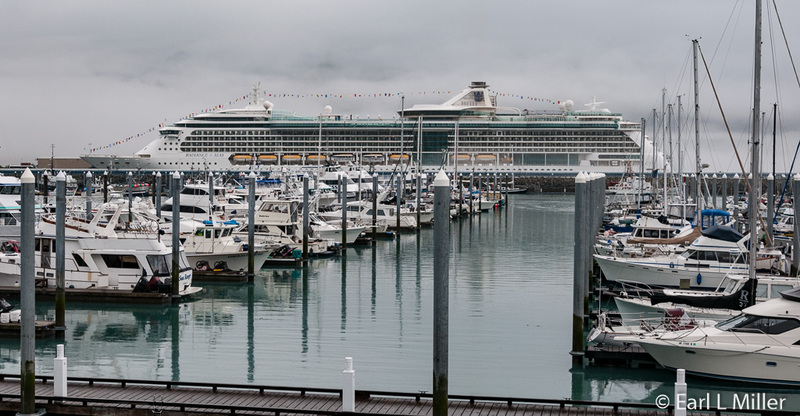 If your cruise ends in Seward, it will be necessary to travel to Anchorage to fly home. Renting a car in Anchorage instead of Seward has several advantages if you intend to see Alaska on your own. It’s less expensive, particularly if you don’t book it at the airport. You can easily turn your car in when you are ready to fly home, and there are more car rental companies since Anchorage is Alaska’s largest city. The question then becomes how do you reach Anchorage? Many people take the cruise ship bus to the Anchorage airport. Others take the train or book a taxi or shuttle traveling this route. We found Alaska Cruise Transportation Company offers three choices. All pick up directly at the cruise ship terminal. We had no problem connecting with their bus. The least expensive choice goes directly from Seward to the Anchorage Airport. It takes 2.5 to 3 hours and costs $45 a person. 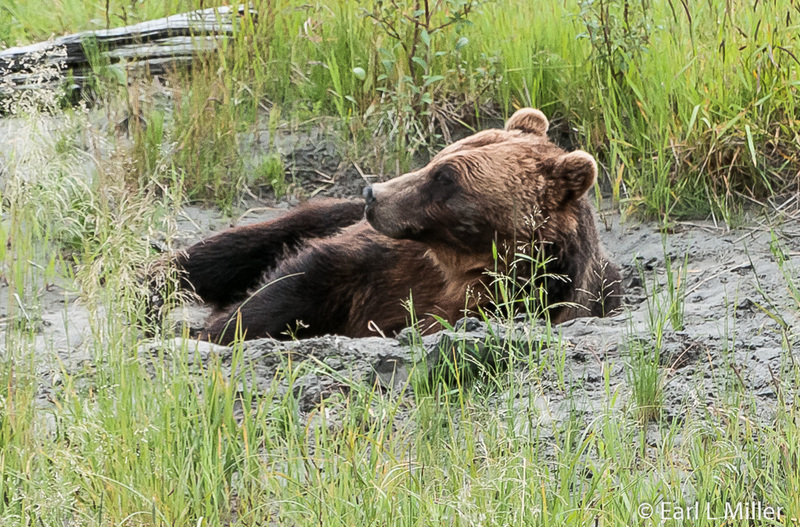 Another option includes a stop and your admission to Alaska Wildlife Conservation Center. The cost is $50 to $65, depending on the day, and takes 4 to 4.5 hours. It goes to Anchorage hotels and the airport. We selected an all day tour which lasted eight hours. The cost was $145 per person including a sack lunch and an excellent narrated tour by our driver, Tim Pope. With 18 people on a 47 passenger bus, we had plenty of room to spread out. We drove through Seward then visited Exit Glacier, the Alaska Wildlife Conservation Center, and the tram at Mt. Alyeska. The trip was on Seward Highway with the last 40 miles along Turnagain Arm. All admissions were included. We finished with a tour of Anchorage including 15-minute stops at the Ulu knife factory and Earthquake Park. After letting some of the passengers off at the airport, we were driven to our hotel, Homewood Suites. The town is named after William Seward, secretary of state under President Andrew Johnson. He was responsible for Alaska being purchased from the Russians in 1867 for $7.2 million ($122 million today), about two cents an acre. Criticized as Seward’s Folly at the time, the purchase has since proved extremely valuable due to the state’s massive natural resources including oil. The resident population is around 2,000 people. However, during the Fourth of July weekend, its popular marathon causes it to swell to around 30,000. Each year 350 men, 350 women, and 250 juniors participate in the race up 3,022-foot Mount Marathon. Located on Resurrection Bay, the town is the gateway to Kenai Fjords National Park which you can explore via full or half day cruises providing close-up views of glaciers and extensive marine life such as whales, Orcas, otters, and Steller sea lions. It’s mile zero for the railroad to Fairbanks and the Iditarod Trail. The town is popular for kayaking, sailing, flight-seeing, and deep-sea fishing adventures. Seward is nicknamed the “Mural Capital of Alaska.” If you have time, drive around town to see thirty-five of them. They celebrate the town’s historic characters, marine life, and special events. We spotted one near the Sea Life Center of blue whales titled “Seward Bound Whale” by Pechuzal and McElroy. We didn’t mind just passing through Seward as this was a town where we would spend two days at the end of our Alaska trip. The bus ride went past the marina; near Sea Life, an incredible marine research and educational institute which we would explore on our return; and by the Benny Benson Monument on Third Avenue. There is a street named after him in Anchorage. In 1927, the Alaska Department of the American Legion sponsored a contest for Alaskan children in grades seven through twelve. Benson, a 13-year-old, who lived in a Seward orphanage, won. He submitted the following description with it: “The blue field is for the Alaska sky and the forget-me-not, an Alaskan flower. The North Star is for the future state of Alaska, the most northerly in the union. The Dipper is for the Great Bear - symbolizing strength.” For his prize, Benson was awarded $1000 and an engraved watch. North of Seward, we stopped at Exit Glacier. The glacier’s origins are from the Harding Icefield in the Kenai Mountains. It’s one of Kenai Fjords National Park’s major attractions since it is one of the state’s most accessible valley glaciers. The glacier has been rapidly retreating. Between 2013 and 2014, it retracted 187 feet. Though it is visible from the road, the best way to see it is to hike one of the two trails that travel to its terminus. These lead from the Exit Glacier Nature Center and the parking lot. A one-mile trail, whose first half is paved, goes through a cottonwood forest to Glacier View. 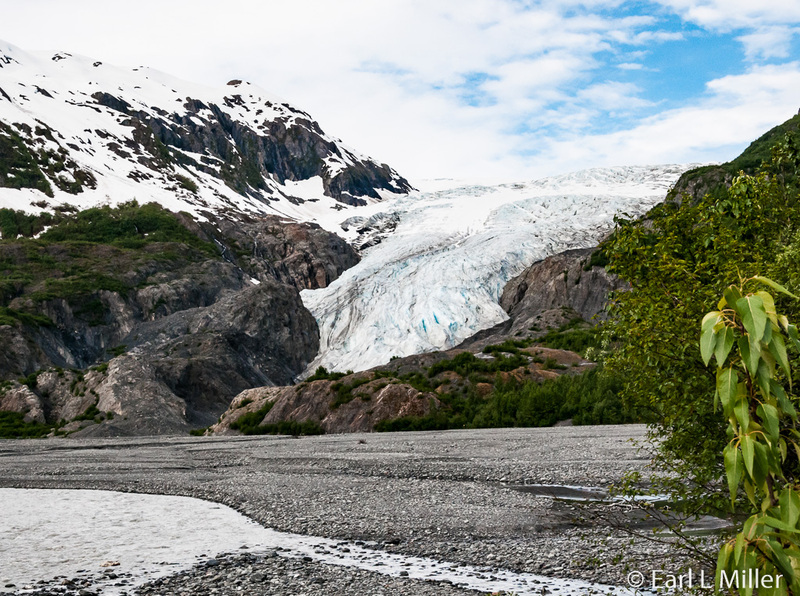 Those who hike this route find a vista of the glacier spilling down from the Harding Icefield. Continue past the kiosk, and you can hike to the Toe of the Glacier or the Edge of the Glacier. From May 28 to September 5 (2016) at 10:00 a.m. daily, you can join a 1-1/2 hour ranger-led hike to the Edge of the Glacier. These depart at 10:00 a.m. and 1:00, 2:00, and 4:00 p.m. No reservations are required. Twenty minute talks are provided at 12:30 p.m. on the same dates focusing on the area’s history or the animals inhabiting this area. They are held at the pavilion, just down the trail from the nature center. Marmot Meadow ranger-led hikes are offered daily June 1 through August 31 (2016.) This hike takes 3 to 4 hours and totals 2.8 miles round trip. It is considered strenuous because of the steep elevation gain. It leaves from the nature center at 9:00 a.m. daily. The nature center has excellent exhibits on the glaciers with the highlight being a large topographical map which is interactive. Press a button and you can light up the Harding Icefield, Exit Glacier, tidewater glacier locations, coastal fjords, and where the boat tours travel. It even shows you where Trulli Peak, the national park’s highest point is located. Another interactive allows to hear the sounds at the glacier by pushing buttons. This includes glaciers and such animals as a marmot, hermit thrush, coyote, and moose. You’ll learn about Exit Glacier’s history and about the glacier’s anatomy such as crevasse and terminus. You can also read about how Exit Glacier is changing with a rapid loss of ice that has accelerated sharply in recent years. The trails and visitor center are open daily from Memorial Day weekend through Labor Day for automobile traffic. The road to the glacier is not plowed during the winter months so is closed to cars and trucks once snow starts falling. It can then be viewed by drivers in such recreational vehicles as snowmobiles. 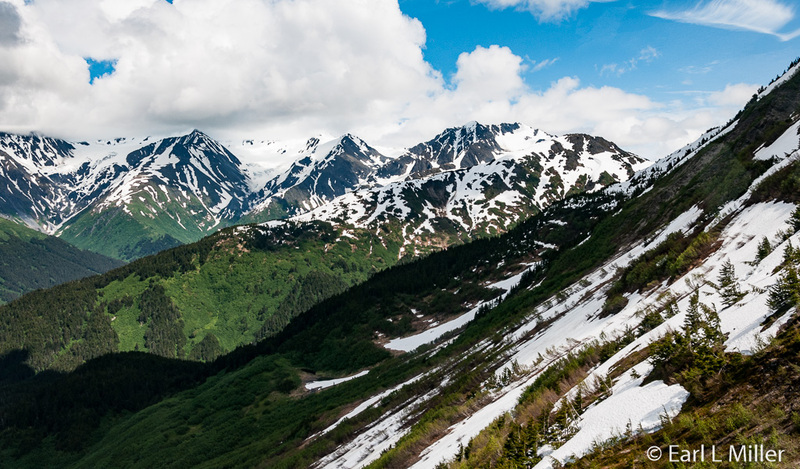 We continued our drive on the Seward Highway, one of only 15 drives in the United States designated an “All American Road.” As it runs along Turnagain Arm, you’ll have views of Cook Inlet and the snow-capped Chugach Mountains. Our guide, Tim, told us British explorer James Cook named the arm during his 1778 cruise when he was forced to “turn again” because the waterway didn’t lead to the Northwest Passage. Tim pointed out various sites to watch for wildlife as we drove past. At Windy Point, we were advised to look for Dall Sheep. Next came Beluga Point, recognized for beluga whale watching. Finally, we passed Potter Marsh which is popular with birders. Unfortunately, we didn’t see any sheep or whales. He informed us that tides in Turnagain Arm rise and fall over a greater range than anywhere else in the United States - 38.9 feet. This bore tide, a wave of water rushing down the arm, can grow as much as six feet deeper in an hour. It’s a combination of salt and fresh water. 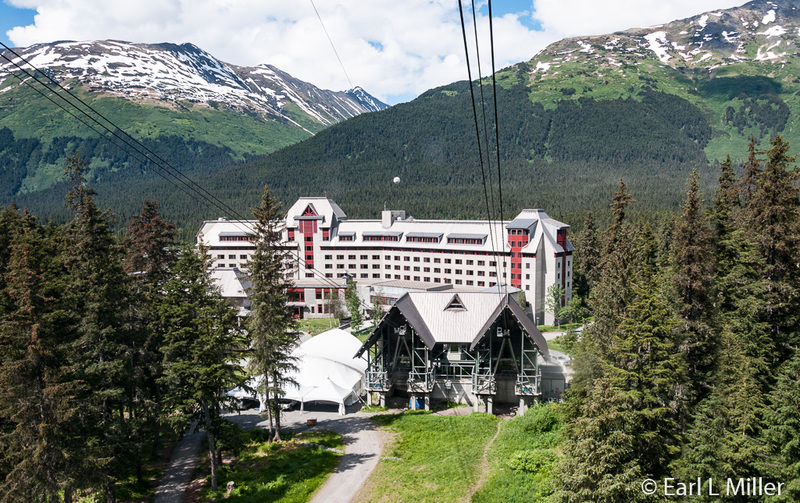 Located 45 miles south of Anchorage, we stopped at Alyeska Resort, a ski resort in Girdwood, for lunch and to ride the tram. Our tram fare, normally $25, was included. A sack lunch consisted of a ham sandwich, banana, chips, cookie, and water. Unfortunately, by the time we reached the front of the bus, the choices of roast beef and turkey sandwiches had been grabbed by everyone else. 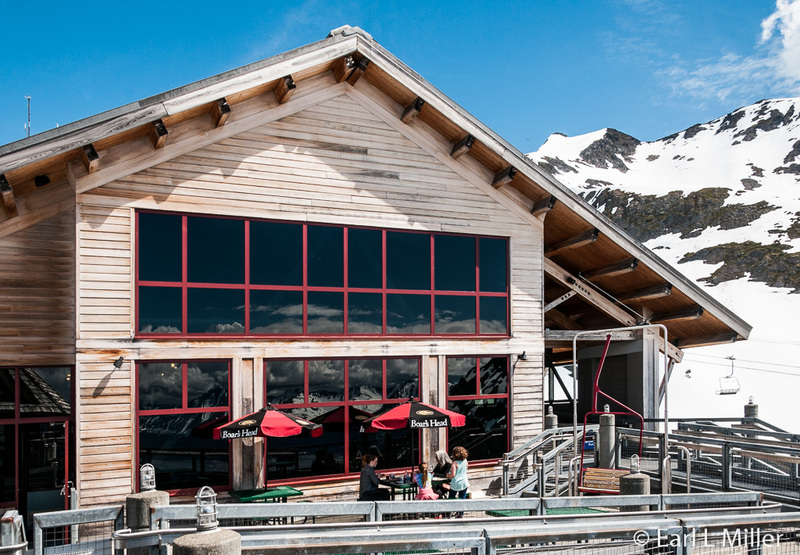 The seven minute tram ride takes you 2,300 feet from the valley floor to the Glacier Tram Terminal. Atop Mt. 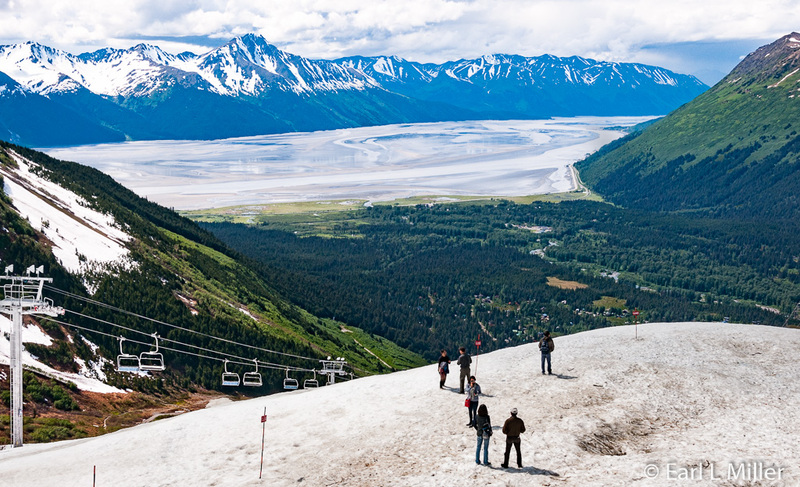 Alyeska, you’ll find the Bore Tide Deli for casual fare, Seven Glaciers restaurant for fine dining, and an observation deck with telescopes. You’ll view mountains, up to seven hanging glaciers, spruce, and, perhaps, some wildlife such as moose or bears. The tramway operates two cars on a counterweight system. One car rises as the other goes down. It was designed by Von Roll Tramsways, Inc. of Switzerland. Each car holds a maximum of 60 persons. 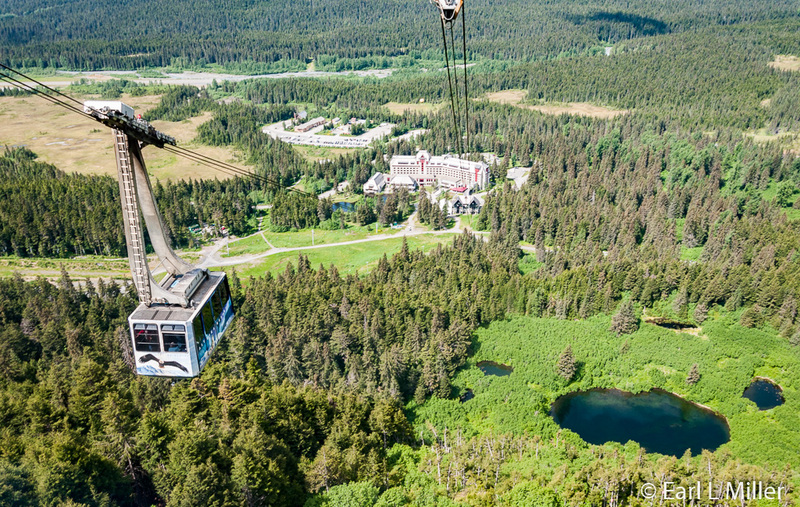 During the summer season, the trams operate at half speed so passengers can enjoy the area’s beauty and wildlife. You can expect to wait 15 minutes between cars. We arrived at Anchorage at 3:22. Tim told us some facts about the city. It contains half of the state’s population. Most of the tall buildings we were seeing were hotels. He informed us that Alaskans consume more ice cream per capita than any other state and are second in Spam consumption. Our 90 minute tour of the city included a 15-minute stop at Earthquake Park. On March 27, 1964, at 5:35 p.m., Alaska was smashed by the strongest earthquake to ever hit North America. With an epicenter 75 miles east of the city, it lasted for 4-1/2 minutes and was rated as 9.2 on the Richter Scale. Eleven aftershocks occurred that day with a magnitude of at least 6.0. For more than a year, smaller aftershocks continued. Turnagain Heights, a neighborhood of 75 homes, slid into Cook Inlet. The homes were never rebuilt, and the location is now the park’s site. The quake also created massive landslides which devastated a major part of downtown Anchorage. It spawned tsunamis that ravaged almost all the coastal towns in Southcentral, Alaska such as Valdez, Whittier, and Seward. Damage and death occurred all the way to California as well as destruction in Hawaii and Japan. It killed 131 people, all but 12 due to the tsunamis. Today, on the park’s north side, you’ll see views of the Chugach Mountains and across Knik Sound. Other spots have excellent views of Anchorage. Sometimes visitors spot a moose in the park’s wooded area. Interpretative signs provide information about the earthquake. We also stopped for 15 minutes at the Ulu Knife Factory which has been making the Alaska ulu for more than 25 years. Starting off in a garage, the factory and retail store is now located downtown. Its web site touts this factory as having the best quality and the widest selection of ulu knives and accessories to be found anywhere. Eskimos used ulus as their main cutting tool to skin seals, sew boots, eat seal and blubber, or fillet salmon. The women used them to prepare walrus hides for their skin boats. To me, they resemble the old fashioned kitchen chopping tool, where the force comes from the center. You employ a rocking motion to use them. Blades were made from flat, thin rocks; slate; or jade while the handles were constructed from wood, ivory, or bone. Like most Alaskan Native American handwork, they often had the distinctive markings of the artist who made them. The factory now uses stainless steel for their blades. The basic shape is created by unwinding 3,000 pound coils and pushing this steel ribbon through a 100-ton punch press. The beveled edge is shaped to a precise angle. To harden the blade, it is heated to 1950 degrees Fahrenheit in a computer-controlled oven. Then the surface is polished using several different compounds and a polishing wheel. The next step is to hone the edge by using a 16-inch stone. This is done under constant coolant to preserve the edge’s hardness. Alaska birch and American walnut are the most popular woods the factory uses for their handles. Each handle is shaped to meet exact specifications then treated to several finishing operations. The manufacturing process ends with each ulu knife being inspected and receiving a final coat of oil before packaging. Our Anchorage tour covered downtown as well as some of the city’s residential areas. Among the sites we saw were the Alaskan train headquarters, a statue of Captain Cook on Resolution Bay, an underground home, and Lake Hood where small planes average 700 takeoffs/landings daily. Our trolley tour the next day duplicated his path. For me, the tour’s highlight was the Alaska Wildlife Conservation Center, located on Seward Highway before we reached Girdwood. It houses 75 animals from 13 different species. We only had 45 minutes on our tour so at the end of our Alaska trip, we stopped for another visit here. Conserving Alaska’s wildlife through education and quality animal care has always been the center’s mission. AWCC takes in injured and orphaned animals year-round. The hope is to return wildlife to the wild. Those animals unable to do so, because of injury or intensive human imprinting, have permanent homes at the center. Each animal has his or her own story. A free narrated shuttle goes around the grounds. Leaving from the gift shop, it’s about a 50 minute tour departing every hour on the hour from 10:00 a.m. to 5:00 p.m. The shuttle provides an opportunity to learn about all of the animals. However, since there are fences around the large natural habitats, we found it necessary to drive the almost two-mile loop, with frequent stops to do close up photography. Another option is to walk the route instead. Programs are held in the animals’ designated enclosures. Since times and locations can vary, it’s best to check the day’s schedule at the extensive gift shop where all proceeds go for animal care. While boarding the shuttle, we saw Chuckles, a halter trained reindeer. The center’s initial reindeer herd was rescued from the Aleutian Islands where they were becoming overpopulated. To prevent starvation, they were brought to AWCC. We spotted Snickers, the porcupine, in his cage. He was raised in a home and relocated to AWCC. He is the center’s Youtube star as a video of him has received more than three million views. We next heard about Deshka, a female tundra wolf who arrived as an 8-week-old pup from a captive wildlife facility in Montana. Sometimes, Remington, a German shepherd/malamute or Tug, a malamute, visits Deshka. 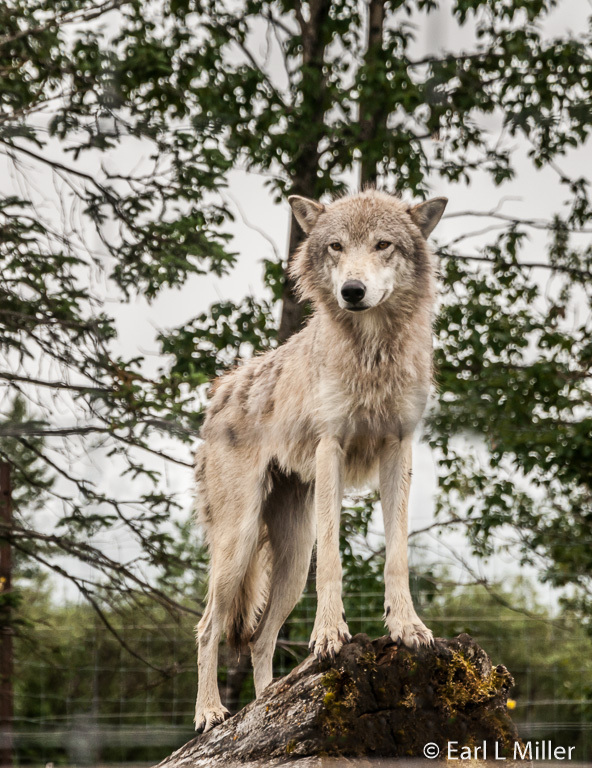 AWCC uses the dogs to maintain a natural social interaction since the wolf is housed by himself. Jade is a Red fox picked up by loggers on a running trail to Anchorage. Storm is a white and grey marble colored fox. She was illegally bred as a domesticated animal until her rescue in 2015. She is an adaptation of a Red fox and part of AWCC’s educational program. We passed a series of ghost trees which were the result of the 1964 earthquake. When the ground in this area dropped 12 to 15 feet, salt water came in and killed the trees. 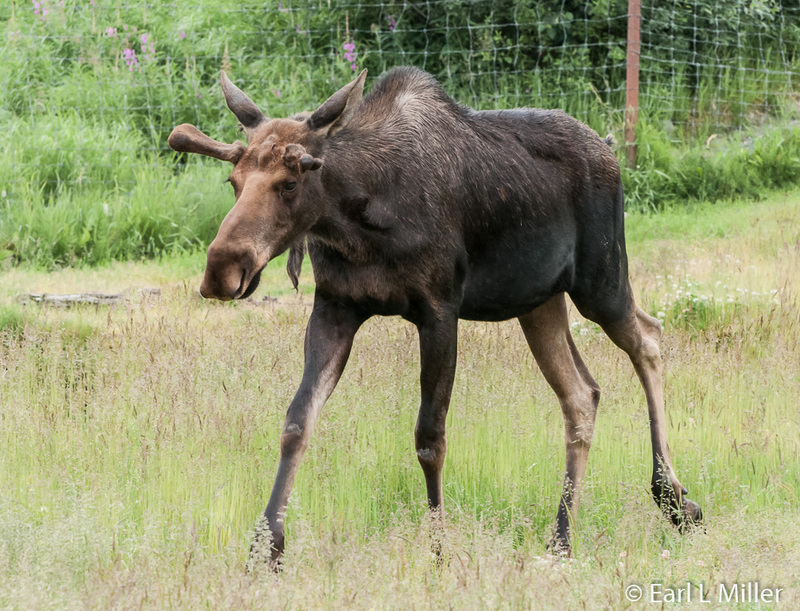 Tok is a male moose who arrived at AWCC in 2015. He was discovered wandering in a resident’s yard and was never claimed by his mother. 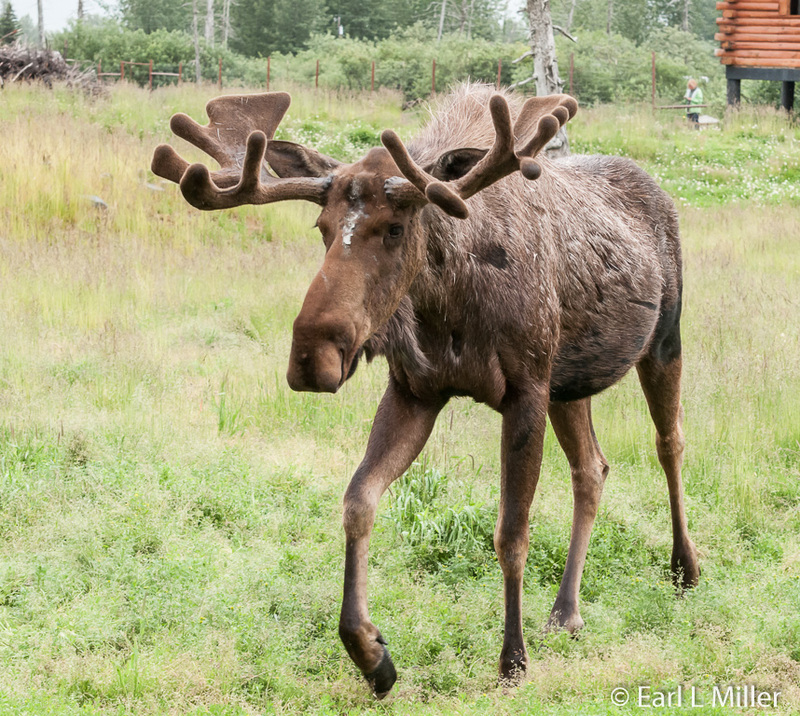 Teddy, known around AWCC for his large, developed antlers, is a bull moose discovered at Talkeetna in June 2012. He was found as a calf with bite marks that needed immediate care. Teddy was named after Senator Ted Stephens. He has participated in dietary studies and been in movies and television commercials..
AWCC is home to male and female elk herds. The females, fawns, and immature males are in one pasture while the mature males have their own area. 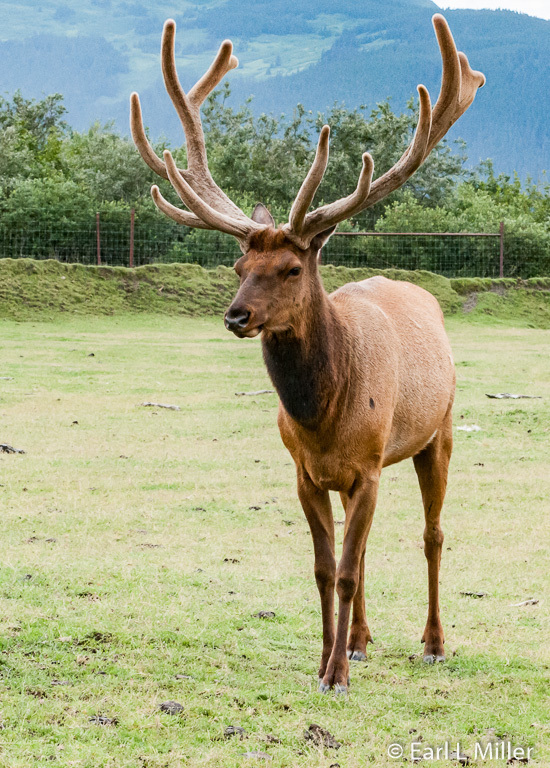 Only male elks have antlers. They lose their racks every year. The dominant male with the largest set of antlers is Homer while the second largest is Danny Junior. The center also separates mature male muskoxen from the rest of the herd. Muskoxen are members of the goat family. Their wool is called Qiviut which is eight times warmer than wool and softer than cashmere. 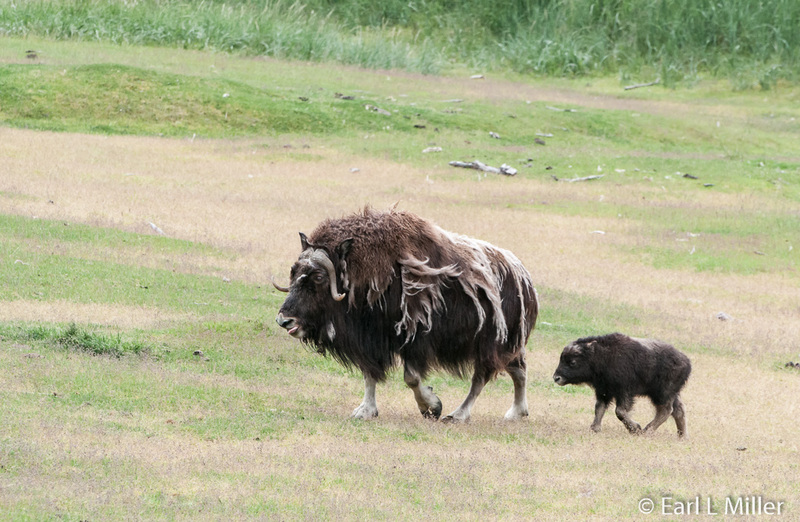 AWCC works very closely with the University of Alaska’s Large Animal Research Station in Fairbanks regarding muskoxen. Separation of the muskoxen and elk herds into sexes allows for better control of breeding. It’s also safer to deal with the smaller herds, particularly if veterinary care is required. Kuma, a black bear, was found in interior Alaska. In May 2002, he fell into a hole in a backyard where the owner was putting in a septic system. The cub was unable to get out. When he was discovered, the sow was not around. He loves to hang out in the cottonwood tree. Cameron, our guide on the shuttle, told us every bear in Alaska has its birthday the same day, January 1, as naturalists aren’t sure when the bears are born. AWCC has three brown bears with the biggest weighing 1,000 pounds. Hugo, a female grizzly bear, is the smallest. In 2000, as an orphaned cub, she had been attacked by a porcupine and was covered with hundreds of quills in her paws. When found, she was unable to walk or eat. Hugo cannot be released since she does not have the skills to survive. 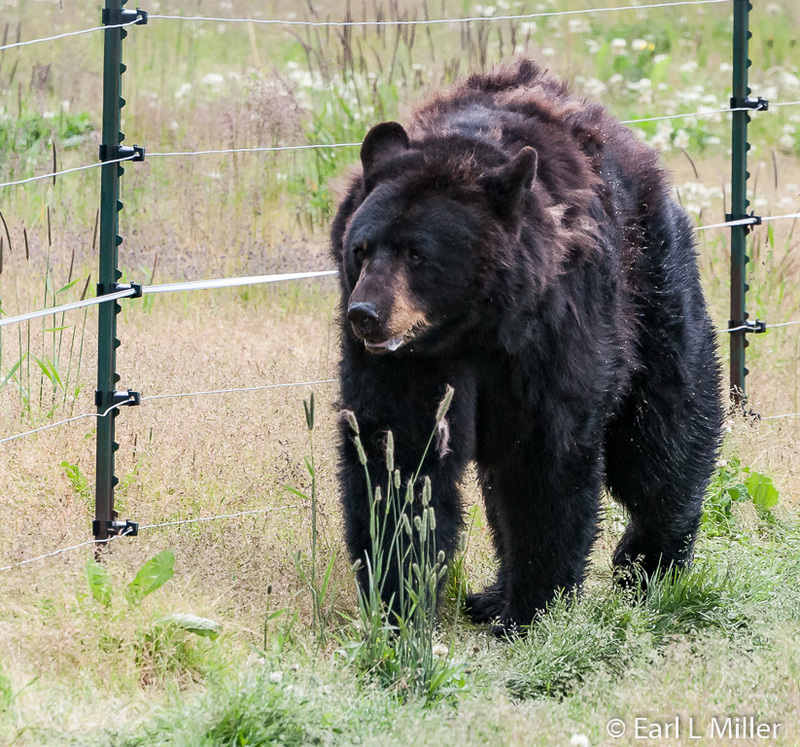 She was AWCC’s first bear to be given a permanent home. Joe Boxer and Patron are two twin brown bears who were rescued as orphaned cubs. A wildlife biologist rescued them from on top of a birch tree after their mother had been killed. We passed several wood bison including a female with two calves. AWCC has been actively involved with a conservation project concerning this species, the largest land mammal in North America. They had been extinct in Alaska for more than 100 years before 13 of them arrived November 2003 from Canada’s Yukon Territory. During 2005, the first calves in more than 100 years were born in Alaska. Since 2006, the center has seen the birth of multiple calves each spring. AWCC received 53 calves from Canada in 2008 and integrated them with their existing herd. In the spring of 2015, the first wood bison were reintroduced back into the wild. 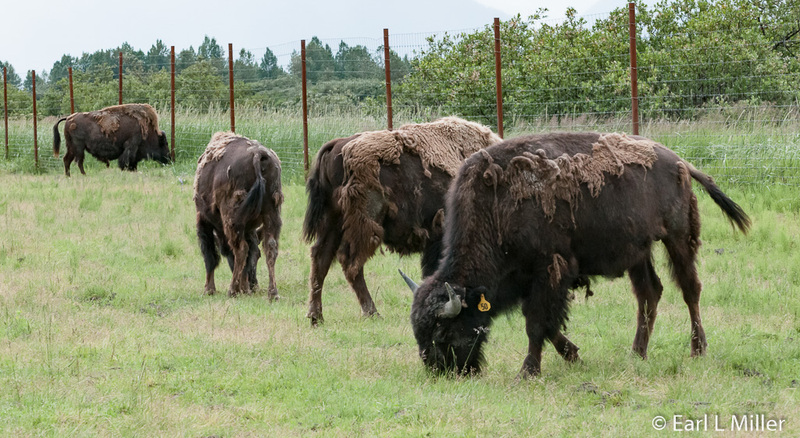 AWCC’s herd is the only wood bison herd in the states. AWCC also has four Sitka black-tailed deer consisting of Solo and his sons. This is the second smallest species of deer in North America with Key deer being the smallest. Sitkas are a sub species of mule deer. Bison Hall, an educational center, is expected to be finished by the end of 2017. This will be a dedicated home to the education department complete with a classroom and a program hall. It will also house staff offices. Near where this building is being constructed, visitors find two lynxes, a bald eagle, and a great horned owl. During the summer of 2004, a working firefighter spotted a month-old lynx kitten in a recently burned area in Interior Alaska. It suffered from burns on its paws, legs, face, and ears. It was flown to Anchorage , transported to AWCC, and named Venetie. 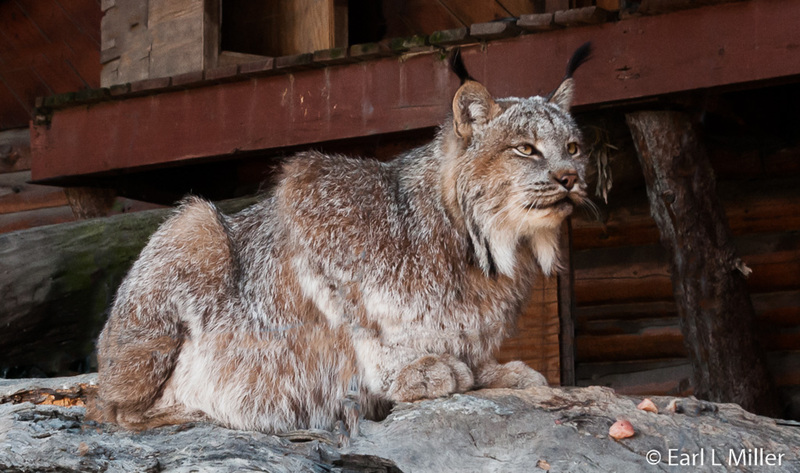 The other lynx, Chena, was kept illegally inside a chicken coop in North Pole, Alaska. Kittens normally stay with their mothers for almost a year to learn hunting and survival skills. Since these were orphaned at such a young age, they will have a permanent home at the center. Adonis, the bald eagle, was found near a remote Alaskan village and had been shot. His left wing required a full amputation. He has a permanent home at AWCC since he cannot fly. Sometimes other eagles visit the center as a break from flight or hunting near Turnagain Arm. 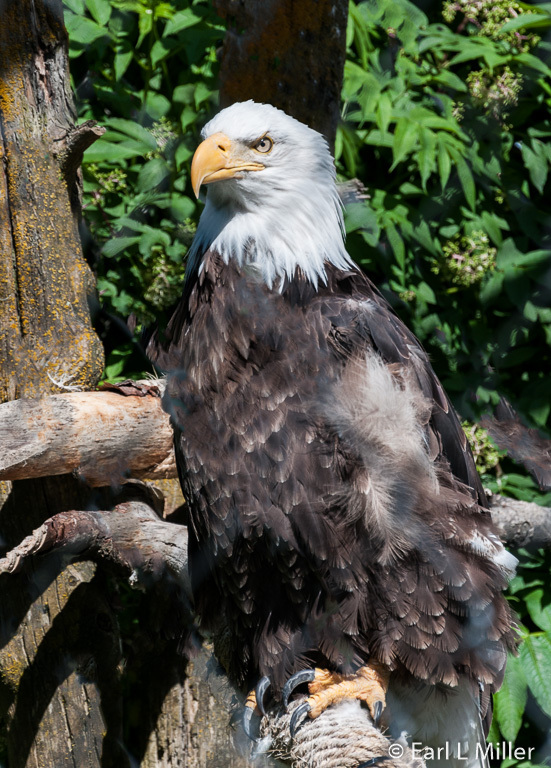 Bald eagles only get white heads when they mature at four or five years of age. Snappy is a male great horned owl. He was found in Anchorage with a severe wing injury, due to a gunshot wound, making him unable to fly. 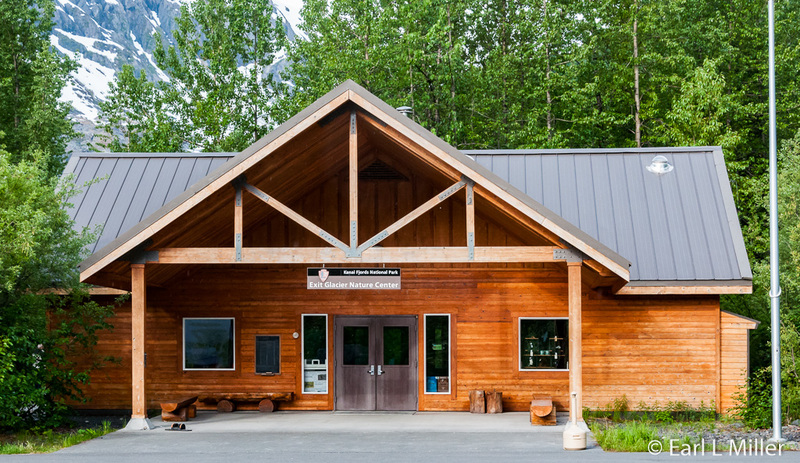 Alaska Wildlife Conservation Center is located on Seward Highway, mile 79, about 47 miles south of Anchorage. Admission prices for 2016 are $12.50 for adults, $9 for ages 13-18 and seniors age 65 and older, and free for children ages 12 and under. The summertime behind the scenes tour lasts 1.5 hours, costs $100 per person, and takes place at 10:00 a.m. and 1:30 p.m. daily. You must be age 12 or older to participate. There is a 12-person maximum on this tour. Operating hours vary depending upon the time of year. From May 8 to September 18, the hours are 8:00 a.m. to 8:00 p.m. Their telephone number is (907) 783-2025.